One District 5 office will be filled by appointment after no candidate qualified to seek election. With no candidate for the Escambia County Soil & Water Conservation District Group 5 seat, the upcoming vacancy will be filled by appointment of the remaining members until the next regular election in 2018, according to the Escambia County Supervisor of Elections Office. 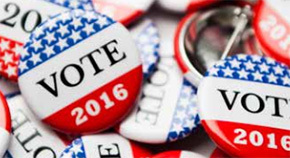 According to the Supervisor of Elections Office, Henry Stromas IV pre-filed, but did not complete the qualification process for the nonpartisan seat. The Escambia County Soil & Water Conservation District Group 5 seat is currently held by Stephen Jones until his term expires in January 2017. The Escambia County Soil & Water Conservation District is a “special district established to provide for control and prevention of soil erosion and for furthering the conservation, development and utilization of soil and water resources, and the disposal of water, to preserve natural resources, control floods, assist in maintaining the navigability of rivers and harbors, preserve wildlife, protect the tax base and public lands, and protect and promote the health, safety and general welfare of the people”. The Florida Department of Economic Opportunity (DEO) has awarded a Community Planning Technical Assistance grant to the Town of Century. The $25,000 grant will be used to update Century’s Land Development Code, which has not been updated since 1992. Across the state, the DEO awarded grants totaling $1.3 million to 43 local governments and regional planning councils. Since 2011-12, DEO has received funds to provide grants to local governments and regional planning councils. Community Planning Technical Assistance grants are for one fiscal year. Grant funding is delivered to the community after performance measures in the grant agreement are met. Thursday Night: A 20 percent chance of showers and thunderstorms. Mostly cloudy, with a low around 71. South wind around 5 mph becoming calm in the evening. Friday: A 40 percent chance of showers and thunderstorms. Partly sunny, with a high near 93. Northeast wind around 5 mph becoming southeast in the afternoon. Friday Night: A 20 percent chance of showers and thunderstorms. Partly cloudy, with a low around 72. South wind around 5 mph becoming calm in the evening. Saturday: A 40 percent chance of showers and thunderstorms. Partly sunny, with a high near 92. Calm wind becoming south around 5 mph in the afternoon. Saturday Night: A 20 percent chance of showers and thunderstorms. Mostly cloudy, with a low around 75. Southwest wind around 5 mph. Sunday: A 40 percent chance of showers and thunderstorms. Partly sunny, with a high near 90. Southwest wind around 5 mph. Sunday Night: A 20 percent chance of showers and thunderstorms. Mostly cloudy, with a low around 74. Southwest wind around 5 mph. Independence Day: A 40 percent chance of showers and thunderstorms. Partly sunny, with a high near 91. Monday Night: Partly cloudy, with a low around 75. Tuesday: A 30 percent chance of showers and thunderstorms. Mostly sunny, with a high near 92. Tuesday Night: A 20 percent chance of showers and thunderstorms. Partly cloudy, with a low around 75. Wednesday: A 30 percent chance of showers and thunderstorms. Mostly sunny, with a high near 94. A Flomaton man was jailed after deputies say he was caught trying to hide meth down his pants. Escambia County deputies were patrolling at the dead end of Brooms Road outside Century when they observed two males turn and run when they noticed law enforcement. Both men were detained and placed in back of different patrol vehicles. While 27-year old Travis Lee Salter was being questioned, a deputy reported that he saw three baggies of an unknown substance had been placed on the center floor area of his patrol vehicle, along with a watch and over the counter sleep medications. As Salter was being removed from the deputy’s Tahoe, he allegedly slid down in the floor area where he grabbed a baggie while handcuffed and slid it into the back of his pants. The bag was later determined to contain methamphetamine, according to an arrest report. Salter was charged with felony possession of methamphetamine. 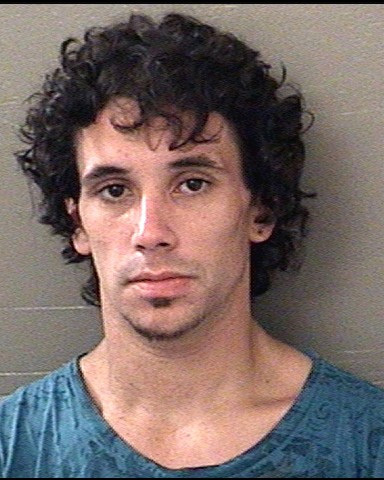 He remained in the Escambia County Jail Thursday morning with bond set $5,000. The second man involved in the incident was not immediately charged with any crime. 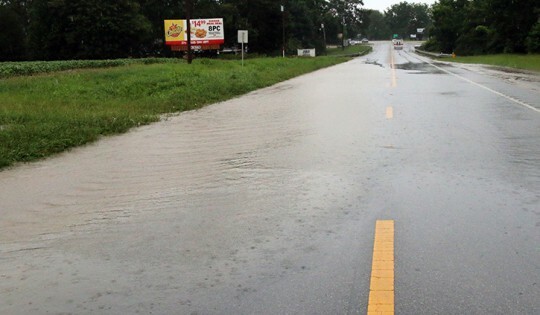 Heavy downpours Wednesday afternoon in the Davisville and Atmore area caused street flooding. 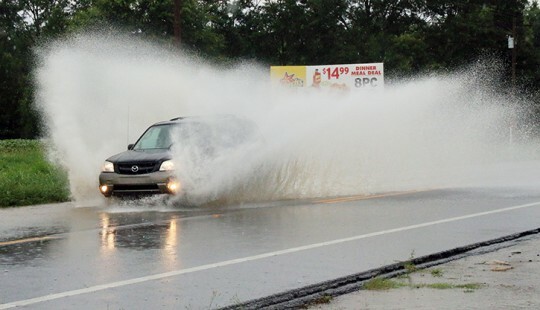 On Highway 97 in Davisville, just south of the Alabama/Florida state line, southbound drivers were welcomed to Florida with flooding in the southbound lane. At least one driver lost control and ran off the roadway. 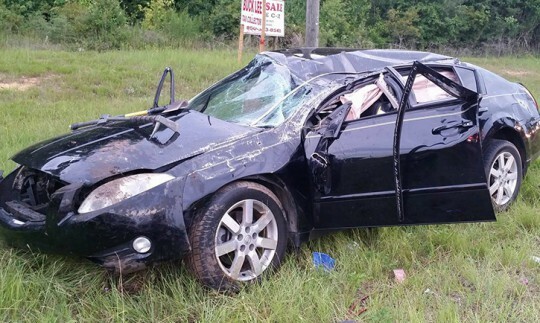 On Highway 31 east of Atmore near Florida Highway, heavy rain led to an accident with injuries. There was no word on the severity of the accident (bottom photo). Pictured above and below: Flooding on Highway 97 just south of the state line in Davisville Wednesday afternoon. 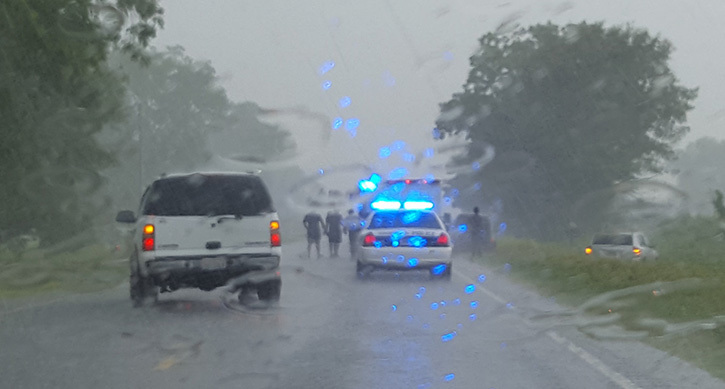 Bottom photo: An accident during heavy rain on Highway 31 just east of Atmore. NorthEscambia.com photos, click to enlarge. The Escambia County Board of County Commissioners is seeking county residents interested in volunteering to fill a vacancy on the West Florida Public Library Board of Governance.The duties of the board include establishing policy and overseeing the management of Escambia County library services and to make recommendations to the BCC regarding the annual budget according to the purposes and authority set forth in resolutions, interlocal agreements and other agreements, as well as state and federal laws. These duties also include establishing an annual plan of service and the long-range strategic planning of library services. West Florida Public Libraries provides service to all of Escambia County, with the board typically meeting on the fourth Monday of the month from 4 to 6:30 p.m. 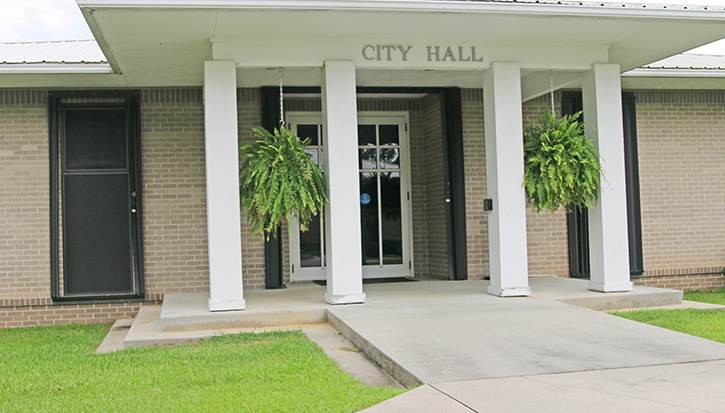 Residents interested in serving on the board are asked to submit a resume and letter indicating their desire to serve by close of business on Tuesday, July 5. Resumes should be submitted to Todd J. Humble, Director, West Florida Public Libraries, 239 N. Spring Street, Pensacola, FL, 32502 or by email to tjhumble@mywfpl.com. State financial regulators have issued a warning to Floridians and tourists to be on guard for vacation and travel scams. The Office of Financial Regulation posted the “consumer alert” regarding vacation rental, sweepstakes and social-media vacation scams that seek large upfront deposits, request personal information or ask for fees to be paid by a wire transfer or prepaid debt card. The state office advises people making vacation or travel plans to be wary of the word “free,” check the company’s direct website and verify a company’s license with the Florida Department of Business and Professional Regulation or the Department of Agriculture and Consumer Services. Someone forgot to tell Tyler Mahle that the hitters in Double-A are better than the ones he dominated in Single-A. Seemingly without a hitch, Mahle has made the mid-season jump to the Pensacola Blue Wahoos from the High-A Daytona Tortugas, so far. 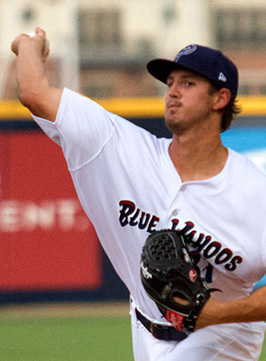 In his Blue Wahoos Stadium debut, the 21-year-old Mahle showed he belongs here by throwing five scoreless innings, striking out eight, including four in a row, and pitching his way out of two bases-loaded jams. His poise helped Pensacola win the opener of the five game series against Chattanooga, shutting them out, 3-0, in front of the Blue Wahoos 19th sellout crowd of 5,038 Wednesday. Pensacola manager Pat Kelly has followed Mahle, who’s ranked the Cincinnati Reds No. 10 prospect and won the Chief Bender Award as the Reds Minor League Player of the Year last season. The right hander, selected in round seven of the 2013 draft, struck out four in a row and dug himself out of a two-out, bases loaded jam in the fourth inning by striking out Chattanooga first baseman D.J. Hicks on a 92 mph fastball. In the fifth inning, the Lookouts loaded the bases with no outs but Mahle then forced leadoff hitter Zach Granite to fly out to right field and struck out both second baseman Ryan Walker and right fielder Daniel Palka, who leads the Southern League in homeruns (19) and is tied for first in RBIs (59). His strikeout of Palka was a key point in the game. Palka was 5-17 with one home run and three RBIs in the teams’ first meeting in May. He went 1-3 with a walk Wednesday. Mahle ended up working five scoreless innings, allowing four hits, walking two and striking out eight. He’s now 2-0 with a 2.70 ERA. In his two starts, Mahle has racked up 16 strikeouts in 10 innings pitched in his two starts for the Blue Wahoos. On the season, he has 92 strikeouts in 89.1 innings this season between Daytona and Pensacola. In the first half of the 2016 season with Daytona, Mahle dominated hitters, just like he has so far in Pensacola. He allowed opponents to hit just .206 against him for the Tortugas. It included a complete game, no-hitter June 13 against Jupiter Hammerheads. He was 8-3 with a 2.50 ERA and led the Florida State League in strikeouts with 76 and innings pitched with 79.1. Pensacola scored first when first baseman Ray Chang hit a sharp two-out line drive single to left field and then shortstop Zach Vincej followed with a double down the left field line to score Chang from first to put the Blue Wahoos up, 1-0. Pensacola scored two more times in the fifth inning to go ahead, 3-0. Blue Wahoos left fielder Phillip Ervin hit a screamer that went through the shortstop’s legs. Ervin swiped second for his 23 steal of the season and advanced to third when the catcher’s throw rolled into centerfield. He then scored on a wild pitch by Chattanooga starter David Hurlbut to make it a, 2-0, game. With two outs, Brandon Dixon smacked a line drive single to left field and was driven in by Taylor Sparks triple into the right field corner to increase Pensacola’s lead to 3-0. Ervin got on base all four times Wednesday on a double, two walks and an error. His pinch hit grand slam in the Southern League All-Star game June 21 has helped increase his confidence at the plate, he said. Pensacola also showed off some spectacular defense. Blue Wahoos center fielder Brandon Dixon chased down a liner by Chattanooga DH Stuart Turner in the right-center gap threw it to second baseman Alex Blandino, who turned and threw a bullet home to catcher Joe Hudson to get Lookouts shortstop Leo Reginatto out at home plate. Hudson also threw out two Chattanooga base runners trying to steal second base. 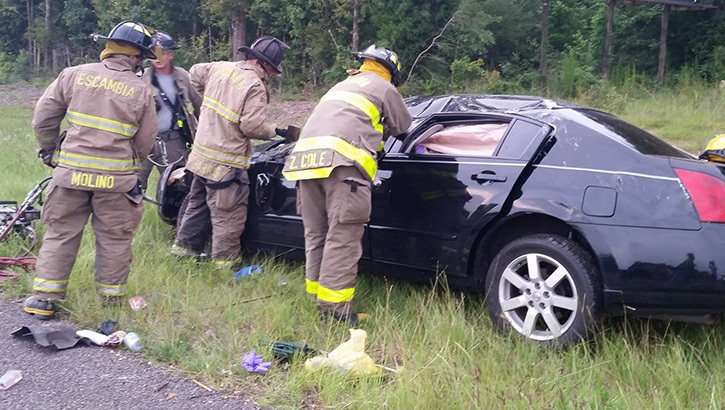 Three people, including a toddler, were injured in a single vehicle rollover Tuesday evening on Highway 29 near Neal Road in Cantonment. The driver was trapped in the vehicle and extricated by first responders. The toddler was reported to be properly restrained and suffered only minor injuries. One person was transported by Escambia County EMS in serious condition; two others, including the toddler, were taken to the hospital by private vehicle. The accident remains under investigation by the Florida Highway Patrol; further details have not yet been released. 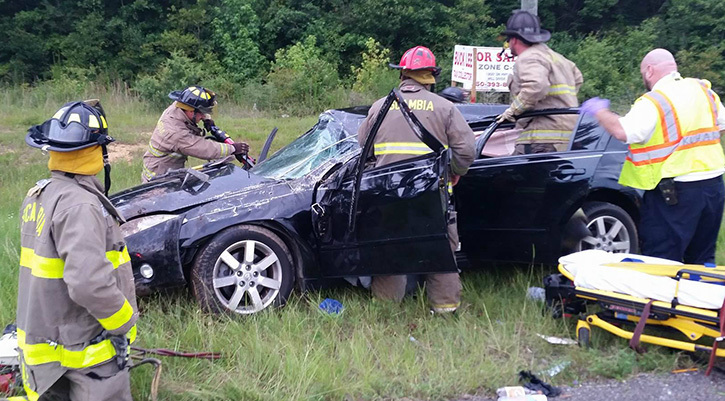 Pictured top and below: Firefighters use the Jaws of Life to free a victim in Cantonment crash Tuesday evening. NorthEscambia.com photos by Kristi Barbour, click to enlarge. Wednesday: Showers and thunderstorms likely. Mostly cloudy, with a high near 89. Calm wind becoming north around 5 mph. Chance of precipitation is 60%. Wednesday Night: A 30 percent chance of showers and thunderstorms before 10pm. Mostly cloudy, with a low around 71. Southeast wind around 5 mph becoming calm. Thursday: A 50 percent chance of showers and thunderstorms. Partly sunny, with a high near 90. Calm wind becoming east around 5 mph in the morning. Thursday Night: A 20 percent chance of showers and thunderstorms before 1am. Mostly cloudy, with a low around 71. South wind around 5 mph becoming calm in the evening. Friday: A 30 percent chance of showers and thunderstorms. Partly sunny, with a high near 91. Calm wind becoming south around 5 mph in the afternoon. Friday Night: Partly cloudy, with a low around 73. South wind around 5 mph. Saturday: A 30 percent chance of showers and thunderstorms. Mostly sunny, with a high near 92. Southwest wind around 5 mph. Saturday Night: A 20 percent chance of showers and thunderstorms. Mostly cloudy, with a low around 74. South wind around 5 mph. Sunday: A 40 percent chance of showers and thunderstorms. Partly sunny, with a high near 92. Sunday Night: Partly cloudy, with a low around 75. Independence Day: A 20 percent chance of showers and thunderstorms. Mostly sunny, with a high near 93. 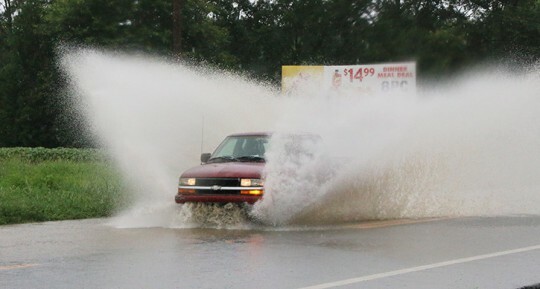 Monday Night: A 20 percent chance of showers and thunderstorms. Partly cloudy, with a low around 76. Tuesday: A 30 percent chance of showers and thunderstorms. Mostly sunny, with a high near 94.